NU-Q students Abdulla Al-Hor and Asmahan Qarjouli interview VICE News Tonight's Maral Usefi and Devin Greenleaf in NU-Q’s Newsroom. Journalism now operates on a 24-hour cycle with the focus shifting to social and mobile audiences, and the U.S. news program VICE News Tonight is moving with it – reinventing TV news programming. 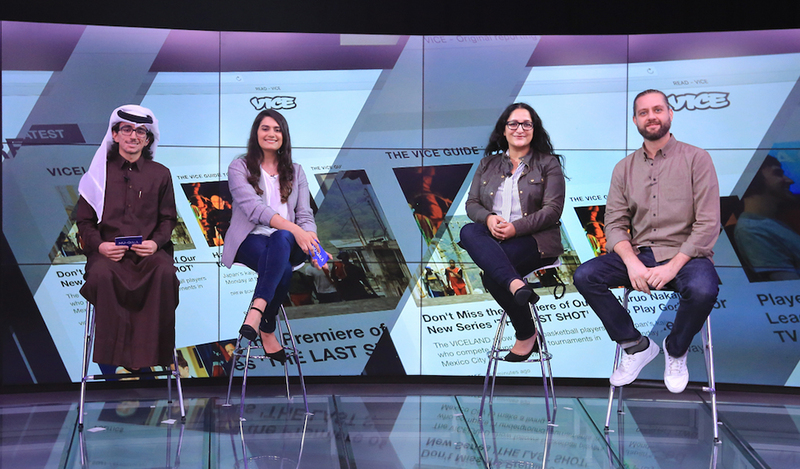 Students at Northwestern University in Qatar (NU-Q) had the opportunity to hear how VICE News is changing the look of nightly news from VICE News Tonight’s head of planning, Devin Greenleaf, and its line producer Maral Usefi. In addition to a public lecture, Greenleaf and Usefi visited classes and met with students and faculty to discuss digital innovation and modern story telling. “NU-Q has a strong partnership with VICE News through our Global Media Experience and Journalism Residency programs, and we were delighted to welcome them to our campus in Doha and learn more about the changes taking place in TV news – including utilizing unique elements like animation and 360-video,” said Everette E. Dennis, dean and CEO of NU-Q. VICE News Tonight was created to engage viewers and go beyond simply summarizing the day’s news. The episode VICE News Tonight produced on the Unite the Right rally in Virginia entitled "Charlottesville: Race and Terror" earned the company a 2017 Peabody Award for News Coverage. VICE News Tonight produces content with context and voices from around the world but without ads or anchors. A 22-minute episode typically involves a mix of voiceovers, graphics, and video packages to delve into national and global news, technology, economics, and pop culture. Greenleaf, an Emmy-nominated journalist, described the versatility of their reporting styles saying, “We typically make the format fit the story rather than the other way around, which can require us to reconceptualize what a graphic should look like.” Sometimes there are data-driven stories with little or no visuals associated, so a team of specialists on staff create compelling graphics and use animation to craft “a news package.” This enables VICE News Tonight to tell stories that deserve to be shared but normally would not have made it on a TV news program. Greenleaf’s career began in documentary filmmaking in 2005, and he spent eight years as a producer and news editor with Al Jazeera English in Qatar. An Emmy award-winning director, Usefi helped launch VICE News Tonight for HBO in 2016, and before that, she worked to launch Al Jazeera America overseeing the morning show as senior executive producer. She and Greenleaf discussed questioning all of the conventions surrounding nightly news programs, branching out from the traditional methods of news reporting, and developing their own unconventional approach to reporting through a modernized newscast. At VICE News Tonight, they strive to provide a more in-depth view of specific stories rather than skimming the surface of many stories as other news outlets do. Ultimately, Greenleaf and Usefi stressed to the NU-Q students that having the right sources and the access for every story is key. Both of which require months of planning and developing. Each episode of VICE News Tonight becomes available on VICE News’ website one week after it premieres on the U.S. cable channel HBO.